From 1Sky Michigan Climate Precinct Captain Mark Miller. You can read more from Mark on his blog. During last week's President' Day Actions, a number of 1Sky coordinators, organizers, and volunteers met up with senators while they were back home in their states. The goal was to deliver our message loud and clear: Americans (and voters!) want strong federal legislation to curb carbon emission and transition to a clean renewable energy future now -- and we oppose Sen. Lisa Murkowski’s (R-AK) efforts to gut the Clean Air Act! 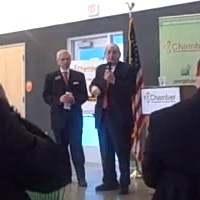 Senator Carl Levin spoke last Monday morning, President's Day, at the Kalamazoo Regional Chamber of Commerce's Legislative Connection event. I went primarily to ask him about his support for climate and energy legislation. I had written to him last year about this issue, and his written reply... well, I touch on that in my question to him. Senator, I wrote to you last year about climate and energy legislation. And your response -- thank you for answering -- you had some good things to say about climate protection, but did not really commit to any specific legislation. I've been reading some studies from a number of universities that look at the current ACES bill that passed the House, and they say that it would create 42,000 net jobs here in Michigan, and increase our GDP by about $2 billion. Now, two questions. If you were convinced that climate legislation would actually increase our economy, would you commit to supporting it? And secondly, what do you think are the prospects for climate and energy legislation in the Senate this year? The numbers in my question came from a summary of a study from the University of California, University of Illinois, and Yale, looking at economic impacts of climate legislation; the one covering Michigan is available here. 1Sky staffer Jesse Worker had provided this to me when I alerted him that this event was coming up and that I was attending. Note that the economic benefits in these projections are net; that is, they are modeling the increases and decreases, and finding the sum is positive. Here is the Senator's answer. I think it is worth taking a careful (and respectful) look at his answer, both the good and the not-so-good. Climate legislation if done right, can create jobs -- I don't think there is any doubt about that. Climate legislation if done right, should pass. Having said this, do I believe we have a carbon dioxide problem? I do. Do I believe the Earth is in danger, over time? I do. Do I believe we should act? I do. We start with that. That's a great start! If all our Senators understood that much, we would be well on our way to solving the climate crisis. Now the question is, how do you act? How do you do it, how do you accomplish it? You can do a carbon tax, some people have supported. Won't pass, probably, because it's a tax. You can do this this cap-and-trade approach, using the market to trade allowances, as they're called -- where the industries that are doing the polluting, the carbon dioxide production, are given allowances, and over time those allowances are reduced, and they can buy allowances if they want to continue to pollute, but it is going to make their products more costly. A cap-and-trade system can work, provided it is fairly distributed, and that means regionally, we gotta share the cost of doing this, there is a cost; there is also job creation, but not uniformly across the country, job creation. So you have got to share the burden. That means that some parts of the country, for instance the industrial part of the country, cannot be paying the cost of this, disproportionately, compared to other parts of the country, unless we want to see everybody continue to leave, to other parts, [from] where we are. That's number one -- is it fairly shared? All of these are good points; but the premise of my question, based on the study mentioned above, was that the costs will actually be negative; that is, there will be economic benefits, and that includes right here in Michigan. Either he did not register this point as I asked it, or he does not agree and simply passed over it. So if we are correct, the question of regional sharing of costs (if we do this right) does not arise, since there will be net economic benefits over time. Number two -- what about countries that don't sign on? We can do all the cap-and-trading we want, If China and India are not involved, it will wipe out any gains that we make. A ton of carbon dioxide which is produced in India or China is just as dangerous as a ton of carbon dioxide produced in Michigan or Indiana or Illinois. So, it's got to be global. Some people argue that we can lead and others will follow -- maybe they will. But we can make sure of that by having provisions in this law, which say that if products, for instance, come from countries which do not maintain those standards, that there will be a tax on those products, so that you have a level playing field. There is no point in our putting additional costs on our manufacturers, for instance, if China and India don't and all we do is have another additional layer of imports coming in here. It doesn't do anything for the air, if it is produced there or produced here, it is the same ton -- and it hurts our economy. So there has got to be provisions in a bill that level that playing field, or intended to do that. Again, Sen. Levin is absolutely correct that there must be a global approach, and that everyone needs to sign on. Saying only that much, however, neglects several other realities. Firstly, the U.S. has by far the highest per capita emissions of CO2, at least among large countries. China and India, while they have been increasing emissions (and we must find a way to persuade them to slow down), still emit far less per person, due to their late start in industrial development. It is rather hard to ask a person in China to forgo things which we intend to continue to enjoy, when we are not willing to make similar sacrifices. Secondly, his answer ignores the fact that Europe is ahead of us in carbon mitigation, and China is adding wind power faster than we are right now! Nobody's asking us to go first -- we need to catch up! The fact that no new climate agreement was reached at Copenhagen can be directly laid at the feet of the U.S. Senate. Finally, it is a global issue, I believe -- climate change is a global issue. It's not an issue which varies from state to state -- and I have a major problem with a provision in the House bill which allows California to have different standards for emissions on automobiles sold in California, that are sold in the rest of the country. Since it is a global issue, we should treat it globally, and that means set a tough national standard for auto emissions, but one standard, because our auto manufacturers should not face different standards in different states. California wants a waiver. I very strongly oppose that waiver, because of my belief that this is a global issue, not a state issue, and that is one of the differences that I have also with the House bill. Here is the only place in his answer where I believe the Senator is being slightly disingenuous. Yes, it is a global issue; and yes, we should have one tough national standard. But I don't really believe that is the reason he opposes the California waiver. It is simply for the convenience of the auto industry. And that is a perfectly legitimate interest; it just doesn't happen to fit the way he framed his answer. So I start where you start -- and where you finish -- which is that we should act! And I believe we must, for our kids and our grandkids. I believe it. But we also have to do it in a way that makes sense. Can't disagree with this at all. Again, if the Senate were where he is, we would have a solution in hand. After the event was over, he came straight up to me and continued his answer, even though there were far more prominent folks (than me) waiting to talk with him. He wanted to make sure I understood that he understood the importance of climate protection. That gave me the opportunity to place the two-page summary of the economic benefits study into his hands, saying "Here -- read this in the car on the way to your next event." He said he would. Reflecting on this event, I am confirmed in my long-held belief that for all our faults, this is a pretty cool country we live in. Here is one of the most powerful people in the nation, and someone like me, one out of 300 million, can go to a breakfast, say my piece and be heard by him. Did I influence him? Who knows? But for a few minutes, I know I had his attention, just as much as the highest price lobbyist does. And I pitched my little pebble into the pond.